Home » General, Roofing, Soffits, Fascias and Cladding » It’s Wimbledon Fortnight – must be time to replace the guttering! Whilst my wife will be glued to the TV these 2 weeks watching the tennis I will be doing odd jobs around the house as control of the TV is lost to her. 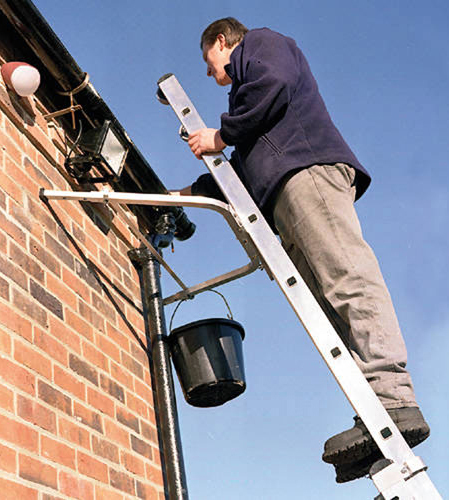 So I started looking around online for suggestions on what tools I needed and how to go about doing it safely, ladders aren’t my strong point! It wasn’t long before I came across a site showing how to avoid the 5 worst gutter cleaning accidents, all of which seem to involve ladders just to clean a gutter, let alone replace one. I also noticed that my fascias were in a poor state and I was undecided about whether to replace them as well or simply touch them up. After finding advice through a DIY forum it quickly became apparent of the scale of the project I was beginning to undertake. Costing was also not that easy and really required a professional who knew what they were doing. Eventually we decided not to replace the fascias but instead clean them down and re paint. The option of buying new plastic covers was available, but we were not keen on the look and decided the hard work to restore the current wooden ones would be worth the effort. The videos showing all the ladder accidents had quickly put me off using one and so we were going to also need some form of scaffolding.We estimated we could probably get all the bits needed including the mobile scaffolding hire for 3 days which was a much safer option, for around 500 pounds total cost. Meanwhile in between players dropping out through injuries and my wife’s utter shock and dismay at Federer losing she went online and posted our project to find out if someone could do the job and what the cost would be. We were contacted by 2 companies one quoted us 500 pounds whilst the other quoted us 450 pounds both were dependent on easy access to the job. The quotes were for replacing the front house guttering one down pipe, to clean the fascia boards, treat the wood and repaint. Both companies said they will be using their own scaffolding tower and both said it would take a day, maybe a day and a half to do and both could start as soon as we needed. My wife and I chatted it over trying to work out why one of the quotes was cheaper than we could do it ourselves and I think a big saving on having their own scaffolding tower was a contributing factor. So we have decided not only on cost but also because they are the experts to use one of the 2 quotes for the job. So it looks like I will be watching the Tennis after all. This article was posted in General, Roofing, Soffits, Fascias and Cladding. Bookmark the permalink. Follow comments with the RSS feed for this post. Both comments and trackbacks are closed.